Not sure this is the right place for this, but thought I would share a tip thats saved me some cash here and there. I use Google Chrome, and a while back I came across a pretty handy little extension that will automatically find buddy discount codes for various products you may be thinking about purchasing via HK. Hope this helps some of you other penny pinchers out there. Thanks, I'll try it out. It doesn't say which buddy code db it connects to - its own? And the creator of that page is probably rich already with affiliate links! Tried the plug-in, but it didn't work that well. The code links listed in the small top right window didn't work, the stuff was added to the cart with normal price. Was worh a try, though. 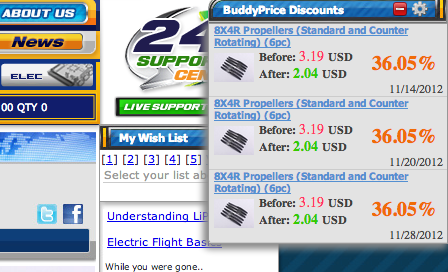 The automatic adding of buddy codes to rc-buddy.com was nice though. You must be logged in to the website, and sometimes the buddycodes have already been used and not deleted. Oh, and there's a limit to how many buddy codes you can use.